If you haven’t guessed it already, I’m pregnant again! Yup, and nauseated. The last several weeks have been challenging, keeping it a secret and cooking and blogging. I’ve been eating very little meat and it’s nearly impossible for me to cook sometimes. Pregnancy turns your taste buds upside down! For a coffee-lover like me, it’s crazy how instantly I have no desire to even smell coffee. I knew I was pregnant! That and the sudden explosion of acne on my face. TMI? I am grateful that this pregnancy has not been as insufferable as the last; still, I really just haven’t felt like eating much. Even drinking water is kind of gross. Anything pickled has been fantastic. Fruit is great except for watermelon. Meat is really hard and so I had to switch mostly to eggs and tofu. Ironically, as I’ve been editing this post the last two days, my nausea spell seems to have been lifted. Yes! Finally! I reached 15 weeks yesterday so it’s about time. I’m even drinking coffee (unfortunately decaf) this morning for the first time in months. 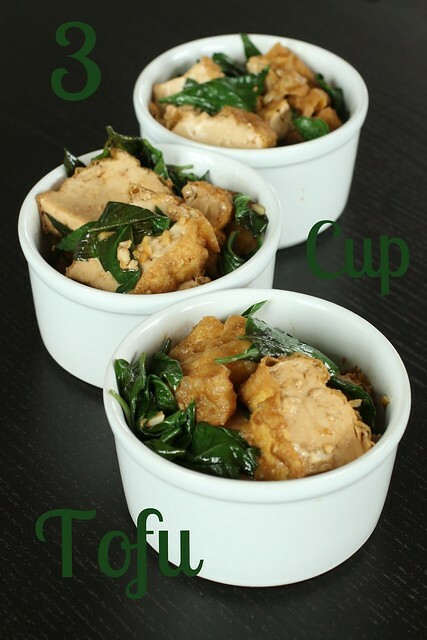 Enjoy this great tofu dish. It’s perfect for those pregnant and not, vegetarian and not, as long as you like basil! Don’t be alarmed when it looks like way more basil than you put in an Italian dish. 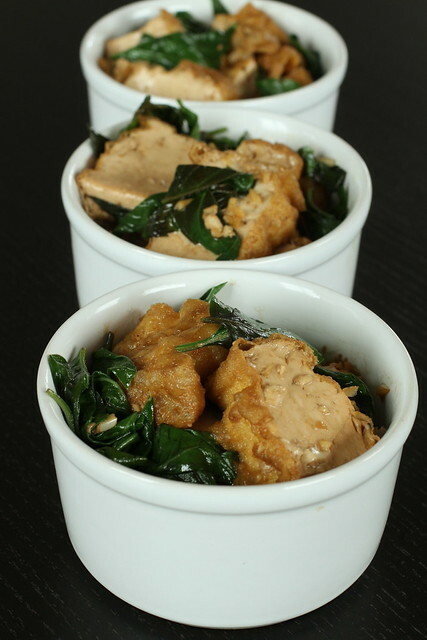 That is how this Taiwanese dish (well the original Three Cup Chicken) is meant to be. 1. In a small bowl, stir together soy sauce, rice wine, sesame oil, and sugar. Set aside. 2. Cut a block of tofu in half. Slice each half into 1/2″ slices. Repeat with the other two blocks of tofu. Set aside. 3. Heat wok on medium heat and add vegetable oil. Swirl around the wok. As soon as you see smoke, add the tofu. Stir-fry gently, trying not to break up the tofu. 4. Add soy sauce mixture and garlic. Stir-fry. Add basil and toss until basil wilts. Serve immediately with steamed rice. posted by jessica	at 05:02 PM	Filed under Chinese, Recipes. You can follow any responses to this entry through the RSS 2.0 feed. Both comments and pings are currently closed. Thanks Cee. Three Cup Chicken does take longer to make but not super long. I’ll be posting that after I feel better about meat. I’ve already gotten a bit better about eating it but cooking it is still not much fun for me. Hope you and the family are doing well! Thanks Yumi, I miss you guys too. We should really have a reunion! Cindy, it’s a type of basil with darker green leaves and purple stems. It has a licorice scent to it. It’s quite different from Italian basil. Congrats on the new addition! & This dish looks wonderful! Great recipe. Amazing photos! This dish is next on my to try list. Thanks for sharing! DanS, let me know what you think! 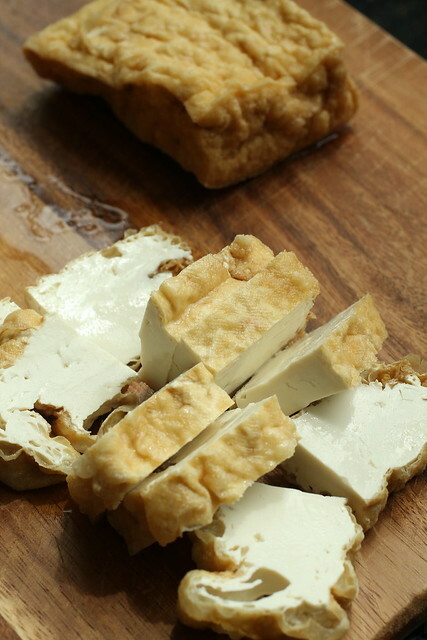 It looks like the tofu in the picture has been cooked before cutting into smaller pieces. Would you tell me how it was cooked?